I love to bake but I have always been intimidated by bread and biscuits. My first attempt at baking bread was in 1978; it was quite an unsuccessful event unless of course you wanted a braided loaf shaped door stopper. I admit that I never gave home made bread much of a chance after that experience. Recently, I came across the holiday issue of Taste of the South magazine and found the recipe for Cheddar-Thyme Drop Biscuits and thought, why not give these a try? They would be the perfect compliment to my parsnip apple soup. Finally, after so many years, the hurdle of biscuit baking has been surmounted! 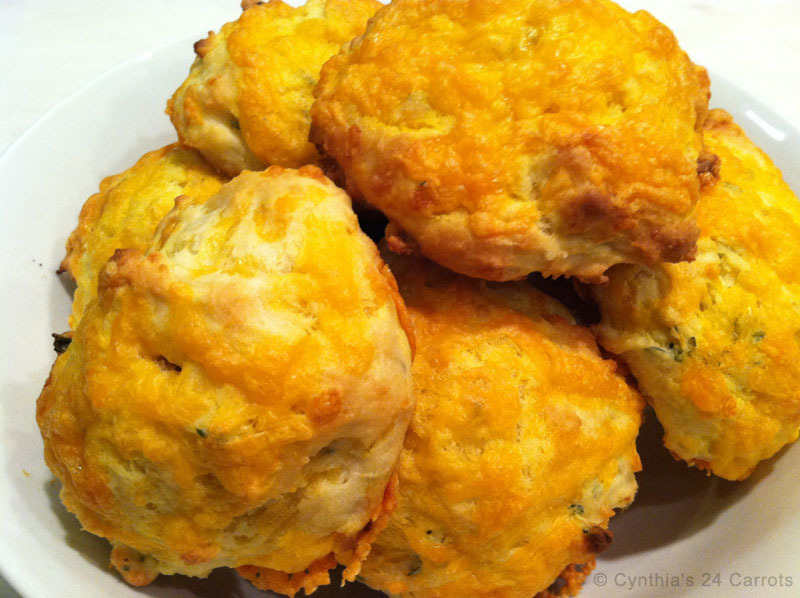 These Cheddar- Thyme Biscuits are light and delicious. They are destined to be a family favorite. In a large bowl, stir together flour, baking powder, sugar, salt, and baking soda. Add buttermilk and melted butter to the flour mixture, stirring to remove any large lumps. Add ½ cup of shredded cheese and thyme, stirring to combine. Drop onto prepared baking sheet by ¼ cupfuls. Sprinkle tops with remaining ½ cup of cheese. Bake until lightly golden, 10 – 12 minutes. Note: I double the amount of cheese and use low fat buttermilk instead of whole buttermilk. I make mine a bit larger than the recipe calls for yielding 12 biscuits and baking for 12 – 14 minutes.